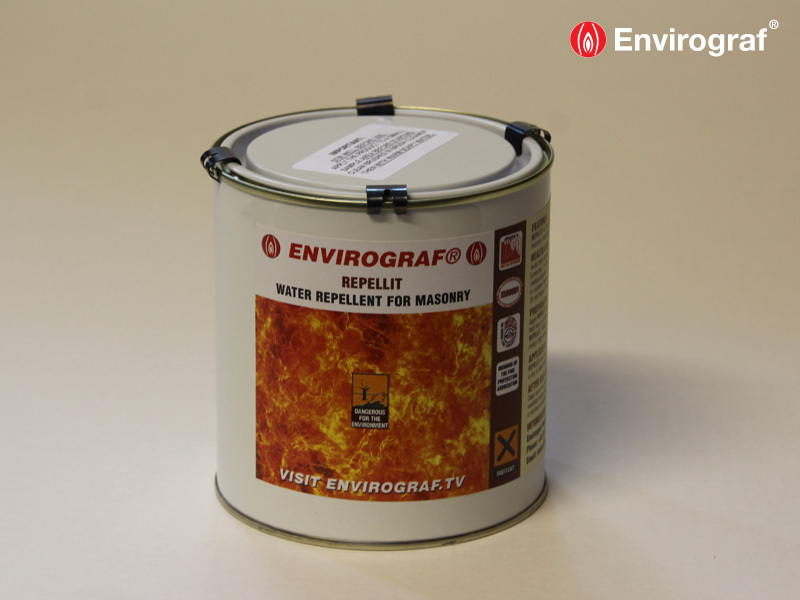 Repellit is an thick, solvent-free, water-repellent coating which dries to a cream-coloured finish. It is designed to drastically reduce water absorption of high-quality, reinforced concrete and masonry, protecting against weather and flooding as well as providing thermal insulation. Repellit is best applied to the concrete by the airless technique, undiluted and in thedesired thickness. Brushes, lambskin rollers or spatulas may be used for smaller areas. Up to 400g/m² may be applied in one operation to vertical surfaces and roofs, without loss of material. The exact amount depends on the absorbency of the substrate. At higher application rates, the impregnating agent might liquefy at the top of the concrete and it might start to run off. A second coat of Repellit may be applied at any time, but is usually unnecessary. To ensure that the cement sets properly, it is best to wait at least two weeks, and preferably four, before impregnating it. Remove coarse particles and dust from new unsoiled surfaces with a brush or compressed air. Use superheated steam to clean weathered surfaces that are heavily soiled with oil or abraded rubber, etc., prior to treatment. Only impregnate concrete that has a uniformly dry surface with no damp patches. Should it suddenly start to rain, stop treatment and cover the impregnated areas. Repellit should not get into direct contact with bitumen. The resistance of insulant against Repellit has to be determined dependant on temperature.